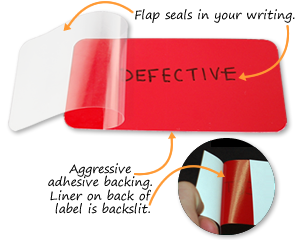 Self-laminating labels provide the ultimate in field-writable labels. Labels have a built-in clear flap that not only provides protection against chemicals, solvents, or water damage, but serves to protect your writing from being changed. • Self-laminating labels are ideal for outdoor areas or harsh environments. Labels are tear-resistant and have an aggressive adhesive that sticks permanently. • To use, simply lift the flap to write your information using a marker or ball-point pen, then press the flap down to seal the laminate, permanently safeguarding your information or legend. • We offer a huge range of self-laminating tags and other label designs. Click here to see our complete self-laminating product range. Print these on your laser printer. Buy direct from manufacturer and save $’s! Choose your size and color-coding. 1 ¾" x 3 ¼"
2 ¼" x 4 ¼"
3 ¼" x 5 ½"